The buildings at the back of Gladstone’s Land date from the 16th century and give a feel of the crowded Old Town of the 18th century. Before the New Town was built, Edinburgh was enclosed by a wall on top of the long ridge of volcanic rock down which runs the Royal Mile. Due to the lack of space, the city was built up instead of out, some tenements rising to 10 stories or more. The rich had rooms at the top of these builidings while the poor lived on the lower floors. James Court was opened out in 1725 to give more space. 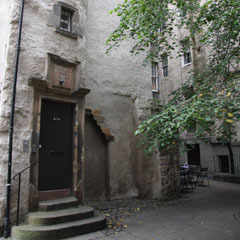 It was here in 1762 that the philosopher David Hume came to live, having been born across the road in Riddle’s Court in 1711.